Mike Ross, owner of Hampden Auto Body in Englewood, Colo., is always on the lookout for new lean processes. He’s a member of the Repair Plan Network, a group of several Colorado shops that regularly exchange ideas for operational efficiency. Ross has implemented many lean procedures, including a full blueprinting process that has improved quality, cycle time and accuracy of estimates. But the significant time required to develop those estimates remained as one bump in the road. Ross says estimating structural damage is a cumbersome and time-consuming process. Vehicles have to be towed to the frame department, strapped down to the frame machine and measured to identify damage specifications. The nearly two-hour process was something that Ross knew needed to get leaner. 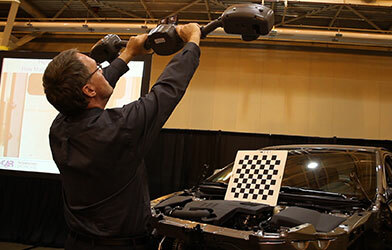 Enter the Matrix Wand, a handheld electronic measuring device for estimating structural collision damage. The tool, which was publicly launched by Matrix Electronic Measuring Systems Inc. in April, uses two cameras that capture three-dimensional images of vehicle damage. Once downloaded into computer software, estimators can use the images to measure all sway, sag and mash with any visible damage points. Ross says a fully accurate structural damage analysis can be printed out in less than 15 minutes—shaving hours off the estimating process while vastly improving accuracy. He says the technology’s accuracy has maintained supplement ratios at less than 1 percent, boosted efficiency throughout the shop, and improved profitability on most jobs. The tool is currently priced at $30,000. It’s a hefty bill, but shop users across the country are recouping the investment in just six months with a revamped estimating process that brings in more money, accuracy, efficiency and repair quality. Here are 10 ways the Matrix Wand can improve your shop’s performance. Ross says the three-dimensional measuring capabilities allow him to measure the height, length, width and depth of damage, which can’t be achieved using traditional tram gauges. That allows him to identify the depth of holes, crumple zones, spot weld locations and twists in a component. Don Putney, president of Collision Equipment Experts based in Elgin, Ill., says there has never been a good way to measure side pillar damage on vehicles. Technicians often have to go through a repeated guess-and-check process, fixing the damage until parts fit properly. Putney says the Wand is capable of conducting comparative damage analyses by comparing the damaged side of a vehicle to the specifications of the undamaged side. That allows estimators to identify exactly how much damage exists in the side pillar so technicians can fit parts on the first attempt. Putney says many shops attempt to estimate structural damage without a frame machine by using tram gauges. But they often acquire inaccurate results because the tool or the vehicle isn’t always level. With the Wand, you don’t have to worry if the vehicle is level. It automatically calibrates to create accurate measurements, regardless of how the vehicle is positioned. Ross says the Wand allows him to measure undamaged vehicles to create his own bank of repair data and specifications. He says that’s beneficial because the information is based on actual vehicle measurements rather than specifications supplied by an information provider, which aren’t always 100 percent accurate. And if you repair several of the same model, Ross says having the research on hand makes life easier for estimators. They know exactly what should be measured, quickly notice misalignment or gaps in panels, and identify inertia damage. Bob Winfrey, co-owner of All Pro Collision Repair, and collision instructor as South Piedmont Community College in North Carolina, says if he didn’t have the Wand, the process for diagnosing structural damage would take multiple hours and create significant bottlenecks, because Winfrey only owns one machine. With the Wand, there is no need to enter the frame department for structural measurements, Winfrey says. The tool can capture the specifications from anywhere, with almost no disassembly, within minutes. Winfrey says upper body measurements can be difficult and time-consuming to acquire. The Wand easily and accurately measures upper body damage, he says. Putney says some shops won’t measure for structural damage if none is visible upon inspection. That’s because they often don’t get reimbursed for the lengthy process if no damage is found. But that’s a poor option because hidden damage often exists, which can lead to problems with quality, part fit and liability if not discovered and repaired. Since the Wand identifies damage quickly, Putney says estimators are able to identify whether any damage exists with little effort. Estimators are also able to quickly determine exact severity of the damage. Whether a rail has 20 or 40 millimeters worth of damage makes a significant difference in identifying problems in other areas of the vehicle, as well as how jobs are triaged through the shop. Winfrey says that allows estimators to provide technicians with full documentation of necessary repairs up front. They’re able to thoroughly map out repairs and order parts before uncovering additional problems late and delaying the process. Winfrey says damage should never be written on estimates if it can’t be proven. And insurers don’t want shops to guess; they want to see a printout of exact specifications to justify the repair. Winfrey says a vehicle recently came to his shop, and the insurance company wrote an estimate to repair the rear body panel, with three hours of labor time to pull the panel out. Winfrey measured the vehicle with the Wand, and uncovered additional damage to the quarter panels. He emailed the image and information to the insurer, and was able to add six more hours of labor time on the estimate to fix the other panels. Winfrey says the documentation provided by the Wand helps tremendously with repair negotiations. He can clearly show adjusters every damage measurement to justify payment included on the estimate. Winfrey says that’s nearly eliminated insurer reinspections, too. He used to wait an entire week for adjusters to inspect additional damage found, which constantly hindered cycle time. Glenn Corvert, owner of Arthur’s Auto Collision & Paint Inc. in Colorado, says many insurance companies don’t allow shops to write estimates for suspension components until the vehicle is on the alignment machine. But that causes supplements and delays when new damage is found because the vehicle is put on the alignment machine near the end of the repair process. Corvert says the Wand includes a predictive wheel alignment application. It measures damage to suspension components, such as the engine cradle, knuckles, ball joints and rails. That allows Corvert to provide insurance companies with legitimate documentation to estimate those repairs up front so he can pre-order parts and keep work flowing. Jan Srack, CEO of Matrix, says the company conducted a study that revealed three out of every 10 vehicles has hidden damage. Those problems are omitted from initial estimates, and shops often aren’t reimbursed for making repairs to damage found late in the process. Winfrey recently repaired a BMW hit in the headlight. The insurance company’s estimate included two hours of setup and one hour of pull time at the frame machine. After measuring the vehicle with the Wand, Winfrey uncovered additional damage to the car’s apron, strut tire and upper rail, amounting to several more labor hours that he could charge for. Winfrey reports that he has been able to add roughly six hours of structural repair time to every estimate using the Wand. With labor reimbursement of $55 an hour, that’s more than $300 added to the repair bill on every job.